(Bloomberg) -- South Korean President Moon Jae-in urged his government to declare a disaster area in the country’s northeast after a wildfire killed one person and forced more than 4,000 others from their homes. 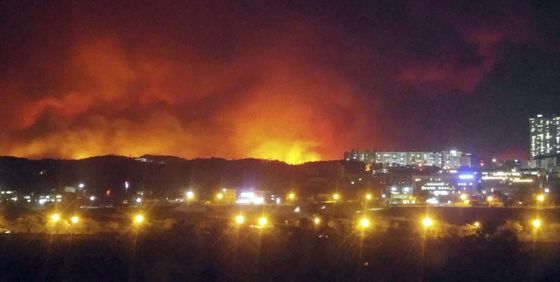 The blaze had consumed about 525 hectares (1,300 acres) as of 2 p.m. local time Friday and affected five cities near the port of Sokcho, the Korea Forest Service said. One man in his 50s was confirmed dead, and another was injured, the Ministry of Interior and Safety said. The affected area was close to the country’s border with North Korea and within an hour’s drive from the site of last year’s Pyeongchang Winter Olympics. The sparsely populated, mountainous area is popular among hikers and sightseers. Moon visited a primary school in Goseong, where he offered words of encouragement to evacuees and first responders. “Hang in there -- we will recover the place as soon as we can,” he said to one evacuee. Earlier, Moon had urged Prime Minister Lee Nak-yon and Interior Minister Kim Bookyum “to look thoroughly at the situation and to consider quickly declaring the area a special disaster zone,” according a statement from the presidential office. South Korean military personnel have also contacted North Korea to update them on firefighting efforts, the office said. Sustained winds as fast as 90 kilometers (55 miles) per hour have driven the fire. South Korea is vulnerable to wildfires due its topography of heavily forested areas on steep slopes, which can accelerate blazes and make them difficult to contain. As of 5 p.m. Friday, about 3,700 of the more than 4,600 people evacuated had returned home, according to the interior ministry. Some 235 houses had been damaged or destroyed, the forest service said.